So some guy says his iPhone 4 is having reception issues. I say there is no reception issue. Now it’s his reality against my reality. Which one of us is living in the real reality? There’s a two-part answer: 1, there is no real reality, and 2, it doesn’t matter. The only thing that matters is which reality our customers will choose to adopt as their own. Of course most people would rather live in a reality where everything works and there are no problems. And now, thanks to me, that reality exists. Because I’ve created that reality for them. Probably the biggest thing I’ve taught the team at Apple is that people never know what they’re supposed to think about anything. This is true in Hollywood, in the book business, in the art world, in politics. And especially in technology. So we put out a new phone and everyone is sitting there wondering what they should think about it. What I realized many years ago — and honestly, it still amazes me — is that most people are so unsure of themselves that they will think whatever we tell them to think. So we tell people that this new phone is not just an incremental upgrade, but rather is the biggest breakthrough since the original iPhone in 2007. We say it’s incredible, amazing, awesome, mind-blowing, overwhelming, magical, revolutionary. We use these words over and over. It’s all patently ridiculous, of course. But people believe it. We demo FaceTime, and we say that nobody in the world has ever seen anything like this before. Jonny and I act stunned and gob-smacked, as if we ourselves still can’t believe that we’ve just invented video chat. Again, this is utterly untrue, a total and absolute lie. But people accept it. They hoot and cheer for us. The other strategy we use comes from Zen Buddhism. You ever study Zen koans? Most of them make no sense at all. You read them and you go away feeling confused and stupid. You see how this works? These two statements cannot both be true. Yet we’ve said both of them. And now you don’t know what to believe. Ask any psychologist what happens to people when they get confused. Their heart rate goes up. Their skin temperature rises. Adrenaline starts to flow. They feel desperate, and scared, as if they’ve fallen out of a boat and now they’re getting tossed by waves and they’re maybe going to drown. Now all you have to do is reach out with some kind of certainty, and no matter how obviously untrue it might be, people will latch onto it. Every religion in the world knows this, from the Catholics to the Scientologists. It’s the oldest trick in the book. You create some uncertainty, you put people at risk — you tell them they’re going to hell, or whatever — and then you hold out the answer. No matter how ridiculous your answer may be — like, the one about the galactic ruler Xenu, or the one where God turns into a bird and flies down to earth and impregnates a virgin — people will accept it. Not only that, they’ll actually thank you for feeding them this horseshit. Because any certainty, no matter how crazy, is better than uncertainty. Which brings me back to iPhone 4 and the antenna issue. Right now you’re confused. You’re worried. You don’t know what to believe. You just wish someone would come along and tell you that everything is squared away and there’s nothing to worry about. Well, stay tuned for that. 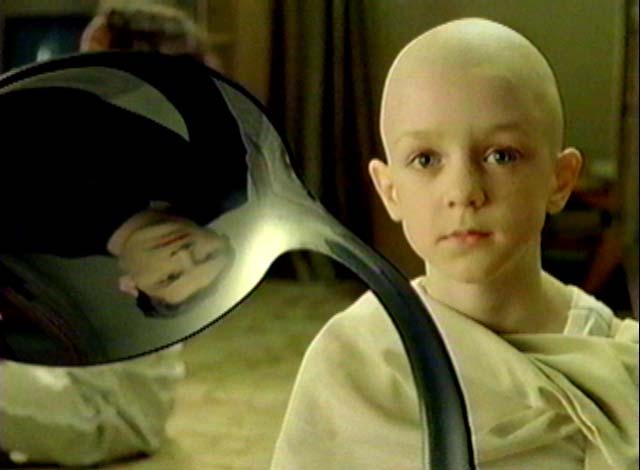 And remember: There is no spoon.